Essential oil is a natural oil extracted from various plant parts by appropriate extraction methods and having the characteristic aroma of the plant or other source from which it is extracted. Most essential oils are extracted by distillation. Essential oils have been used for thousands of years in various cultures for medicinal and health purposes. Essential oil uses range from aromatherapy, household cleaning products, personal beauty care and natural medicine treatments. Ikirezi products are natural and stand out by their uncompromising quality and purity. When you purchasing ikirezi products, you are not only guaranteed a high quality products, but also you are contributing to the uplifting of the livelihood of a poor farmer who works with Ikirezi thus enabling him/her to break the cycle of poverty. We are committed to providing full traceability (“seed to bottle”) of all operations and processes carried out up to the final our product. Since 2006, Ikirezi produces geranium oil. In 2009 the product range has been expanded to include lemongrass and eucalyptus oils. In addition to the three types of organic oil, Ikirezi continues to evaluate additional natural plant products. Between 2010 and 2013 Ikirezi carried out trials to determine growing and distillation protocols of patchouli. Ikirezi is now producing organic patchouli oil using optimum production protocols. In 2013, Tagetes oil was added to our essential oil listand the first batch of rosemary oil will be produced the end of 2017. 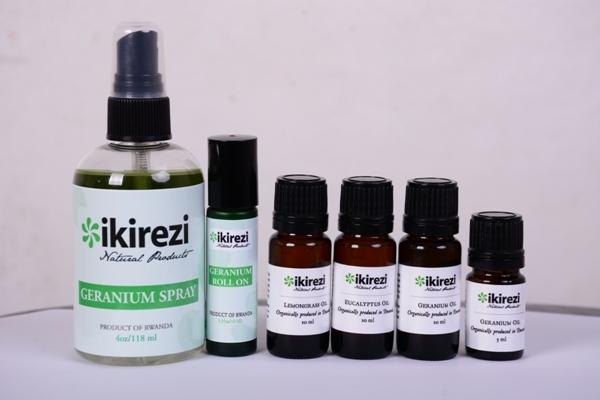 Ikirezi has recently manufactured some essential oils as the main ingredients: Geranium spray and Geranium Roll on which are insect repellents. Ikirezi is committed to organic farming principles and practices in order to improve soil structure, life, fertility and conservation. Our farming, distillation and post-harvest processes are annually inspected and certified organic by ECOCERT, an international certification organization.